I haven't read many historical retellings in my life, but I quite enjoyed this one! 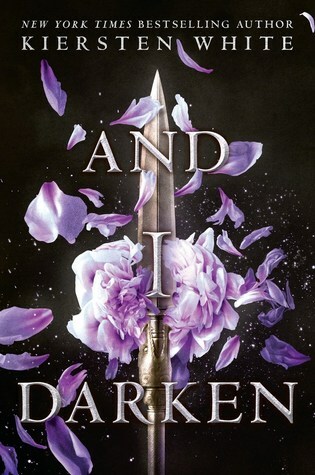 And I Darken tells the story of Lada (a.k.a Vlad the Impaler, but the female version) and her quest for power. Lada is a really ruthless character, and she doesn't bat an eye to bloodshed. She'd gladly be the one causing the bloodshed. How often do we even get characters like her? She's very determined and won't give up no matter what is thrown at her. Her ultimate goal is ruling Wallachia and she doesn't care who she has to kill or betray to do it. Again - ruthless. I love this portrayal, because although we are getting a lot more YA female protagonists these days, most of them have a love interest or are a bit squeamish about murder (which is totally normal). Lada doesn't care about love - not really. She doesn't need a man, and she reminds us enough times about this. Go Lada! Can we get more characters like her? Then we have her brother Radu - the complete opposite. He's soft and prefers to love rather than kill. During the first 12 or so chapters, he's pathetic. He cries all the time and does nothing to defend himself. But we also see his ruthlessness as well, but unlike Lada, he prefers to his words and manipulation. Radu's character development is really well written, where he becomes stronger once he found a religion/faith that fit him best. The contrast between them is quite overwhelming, but it really does give a nice balance to the book. If we only had Lada's bloodthirstiness and cruelty all throughout the book, I don't know how pleasant it would be to read. I think this is quite an interesting read, but I wasn't 100% impressed by it. I loved the beginning, especially how it basically told the story of Lada's life, and not only began from teenage years (or the YA years). It was so cool to see that Lada was already brutal as a child. But the pacing was really off, and the plot slooooooowed once we got to the middle of the book. So many characters were introduced all at once, which made it difficult to keep up. The plot was lagging in the middle, with too many "plot twists", but it did end strong. Who else thought that the love triangle was unnecessary? Radu is painfully in love with Mehmed, but he can't act on it. In his time, it wouldn't be accepted at all. But then it's obvious that Mehmed likes Lada and Lada likes him back (at times). Sometimes, I feel that Lada is just using Mehmed to gain power and doesn't wholly love him back (although she does get confused about her feelings). Poor Radu! I loved this book. I thought the story was all consuming and I loved being immersed in that world. I know a lot of readers felt like you do thou, tat it was too long. Great review!